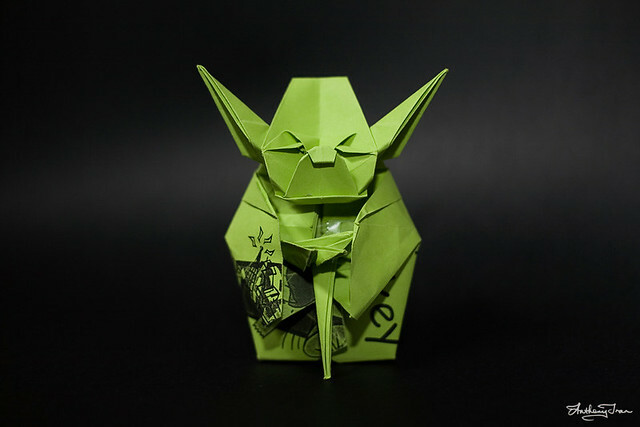 Origami Yoda | Flickr - Photo Sharing! No no, this did not come from the Origami Calendar box! This was something I folded three-and-a-half years ago while bored one night and not studying. It took three painstaking hours to fold. He stands at 4.5in (11.5cm) tall and was folded from an A3 square- approximately 12x12in (30x30cm)! If I had a larger green square, I'd totally do it again. This is by all means not perfect. I took a shortcut with his hand as the paper was too hard to fold. There's a visible bit of sticky tape I used to keep his cloak closed. And he's all green... I'd give him a brown coat if I could! So yeah, I'm pretty serious about origami, and now's my chance to get back into it again. I found the instructions here soon after they were posted. My original photos can also be seen here. NRK P3, lu_lu, sillykitty, and 243 other people added this photo to their favorites. great skill...may the force be with you. err, like soo wow. That is a great piece of art. This is great. If you ever make it down to St Maarten, make sure you bring this and vist Nick Maley (www.yodaguy.com) in Phillipsburg. LOL! FANtastic!!! Found it on Eplore- Congrats!! HAHAHAHa! Learned much, you have, Young Jedi! Great origami, fantastic job, you're much too hard on yourself. wow that looks seriously complicated. no way!! that's so awesome. yoda as an oragami. This is the best origami design, hands down. It was definitely worth the 3.5 hours, and the photography does Origami Yoda justice. Very nice work all around. I really enjoyed this!